i use strong green tea compresses again sunburns. Green tea is avallaible everywhere, even when travelling far away. Thanks Venezia, that’s great advice, it’s so useful to have something that you can get anywhere. Thanks for the wonderful post, Lucinda. I just did a class on poultices and compresses and will certainly forward your post on to my students! Thanks April, that would be lovely. I hope there is something useful in it. Where did you do your class on poultices and compresses? I am very interested in learning this? I can remember my grandmother using compresses and poultices. Having little money she would use what was available in the garden or countryside. 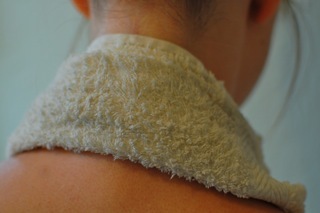 I have used lavender (for tension in the neck muscles). and that has to be my favourite. Also thyme…..for exactly the reasons you explain. These are my two problem areas. I had a beautiful cavalier king charles spaniel who had a heart problem…….this caused a cardiac cough. She would roll in my bed of thyme for around five minutes most days. Animals seem to know instinctively how to take care of themselves……..
Hi Cheryl, Yes animals are still so connected to their senses aren’t they, there is much we can learn from them. I’m hoping to do a course in zoopharmacognacy next month which is all about facilitating animals to self select remedies, it should be fascinating. Thyme compresses saved me from a nasty chest infection a few years ago, so I am also a big fan! A wonderful and very informative article! I remember reading Messegue several years back and being absolutely astounded by his successes treating externally. I often forget how profound making these simple external preparations can be – and I just learned this lesson yet again in trying to treat a rash on my hand. I had tried making all sorts of creams, salves, essential oil blends – you name it. Nothing was making it budge. Then one day, I tried a simple chamomile compress and wallah! It went away within 2 or 3 days. Anyways, thanks for the inspiration and all the great ideas you’ve shared! PS: Zoopharmacognacy sounds so fascinating! Hi Danielle, Yes I have had exactly the same experience with chamomile poultices for a rash on my legs. I had also tried many different things but it was chamomile that did the trick. To me chamomile is a much overlooked super-herb, useful for so many things. The foot and hand bath approach is so interesting isn’t it, it just shows how sensitive and absorbent these parts of our body are. Wow, now that does sound fascinating. Hopefully you will do some posts on the subject. I, for one, would be extremely interested. I remember as a child helping my mom make a sunlight soap and sugar poultice when Dad had a boil on his leg.. does that sound right? I have heard of sugar and soap poultices for drawing things like boils and splinters but I have never used one myself. Did it work? Again.Thank so much for sharing. My mom has an herb garden but we never tried anything like this when I was a kid(that i can remember). I was car accident about a month ago and I bashed my knees into the dashboard badly. My doctor thinks I have swelling in the ligaments/muscles behind my knee and is still testing that. I was wondering is you knew of any compresses that help with muscle/ligament swelling. I’m really interested in the lavender tea compress. I have migraines since I was 18 months old. One of the best things I have ever tried for them is Badger Balm headache soother, it melts the migraine away. I thought about what cheryl said about her king charles spaniel rolling in the thyme interesting. Could kids had that sense too? I remember as a kid there were things I either loved or hated. I loved the smell of green apples, eucalyptus, peppermint and lavender. All of those smells can help migraines. I hated cigarette smoke, perfume that wasn’t a smell I loved, the smell of cheese and aspartame in food. I couldn’t eat aspartame, it would make me sick to my stomach. The things I hated were horrible for my migraines. I definitely think that we still have that sense of what is good for us and what isn’t, it’s just that we have shut down much of our intuition. Animals are known for their abilities to self-select medicines in the wild, it is makes a fascinating study to read up on, it’s known as zoopharmacognasy and I have been meaning to write a post about it for a while. You could try a simple comfrey poultice to help to heal your knee. It would work as a compress too if you made a nice strong tea. I hope it heals well. My 11 year old get severe neck and back pain… Any advice? Do you know what is causing the pain? It could be worth seeing a cranial osteopath or someone similar to check everything is in proper alignment. A nice compress would help ease the pain but you definitely need to address the underlying cause. In the short term something soothing like lavender could help with tension or something warming like ginger might help ease the pain. does anyone know of a poulstice/other that has worked for vitilago? In mid-Sept while doing seemingly innocuous and easy labor, I somehow pulled my back, IT Band which connects to the groin muscle, both sides of the knee and in particular from hip bone to knee along the IT band of my left leg. There were hard under the skin bumps from hip to knee along the IT band. It hit me like a sledgehammer and I ended up on my knees bent over in agony. Literally excruciating. I made my first mistake trying to do stretches with my leg. Really bad move. I made it worse. Second mistake, walking on it. It took me two weeks of lots of drugs and supposed pain relieving balms and patches with little to no relief. I even had to get a cane to Llow me to get to the bath and bed. The pain was so bad I barely slept. One day my mother said a friend ate prepared mustard daily. I was not prepared to eat a teaspoon a day. Ugh. But I tried anyway. Upset stomach! 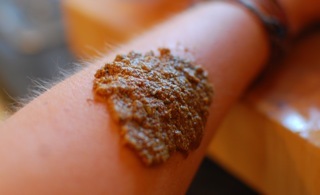 I researched online the benefits of mustard and ran across an article on preparing a mustard poultice to be applied warm to the affected area. I said why not! So I made it. 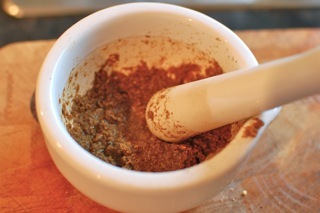 One part ground mustard to 3 parts flour. Add water for a smooth paste. Not too thick but not drippy. I applied it to my leg and covered it with a hot wet towel while sitting on a stool in the tub. I then went to bed. It was magic! And my leg felt better. I was also standing almost upright. I actually slept 5 hours that night. Next day I applied it differently. I used part of an old tshirt fabric and saturated it in a soupier mixture of the same combination. Then I heated it in the microwave. I then applied it in the bathtub again. The heat helps the mustard seep deeper into the muscle. I did this 4/x a day until I could walk without pain. 3 days. I will always use this remedy for back and leg pain again and again. It was amazing. I still have some leg pain but I’m told walking on a messed up IT Band is bad news for recovery. But I do have a life and have to get around on my own. I just take it easy and baby that leg like crazy. THANK YOU MUSTARD. The miracle pain reliever. Did the vet not give you a recipe? I would ring them and ask for more details. A simple green clay and slippery elm poultice might help in the meantime – just mix the two powders with a little warm water and apply over the area. Good luck. Interesting experiences… It’s all about what works. Too often pharmaceutical products don’t work. Has anyone had any good results using compresses or poultices on bulging varicose leg veins? A comfrey poultice on a stubbed toe. Stubbed toe really bad right before bed. Went out and cut some comfrey leaves, made a poultice, put all around toe, wrapped toe in gauze, went to bed. No bruise and could walk with my shoe on the next day! It’s great to know how to plant, grow and use your outdoor medicine cabinet!